Comments-Here is your chance to buy a great red river farm that the ownership dates back to the 1870s and is known as The Egypt Plantation. 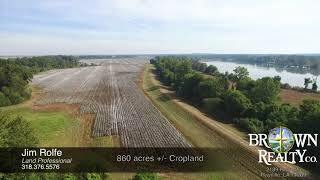 It is a fine farm with great sandy loam soils that can grow a variety of crops including cotton, corn, soybeans, wheat & other. The cotton crop this year appears to be 2 bale plus. Its a great buy for a investor with a good renter in place. Call for details.